Wayne County, located along the base of Lake Ontario, dominates the conversation when it comes to apples. As the largest apple-producing county in New York State, it’s plentiful in orchards, farm stands, u-pick spots and farm markets, as well as apple wines, hard cider, and even vodka distilled from apples! From McIntosh to Empire, heritage varieties to exciting new varieties, apples are so abundant that Wayne County hosts an Annual Apple Tasting Tour each October encouraging visitors to get out and taste them all. But that’s not all the county has to offer. 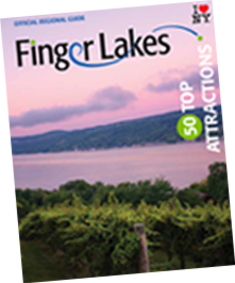 Learn the history of Wayne County at unique museums like the Alling Coverlet Museum, Hoffman Clock Museum, Hotchkiss Peppermint Museum, William Phelps General Store, Sodus Bay Lighthouse Museum or the Museum of Wayne County History – formerly the Wayne County Jail where the only man ever hanged in the area took his last breath. It’s also believed to be haunted, so take caution if you step inside. Take a scenic hike along Lake Ontario and visit Chimney Bluffs State Park. Featuring a dramatic landscape of large, clay drumlins formed by glaciers almost 10,000 years ago, it will wow your Instagram followers and take your breath away. Or stop by the Montezuma Audubon Center and find the resting, nesting, and feeding habitat for waterfowl and other migratory birds. They host a Wildlife Festival every May with special programs, performances, and up-close encounters with the local wildlife. Learn about spiritualism at the Fox Sisters Property and Hydesville Memorial Park. Explore the founding of Mormonism at the Hill Cumorah Visitors Center. Cast a line and catch a fish out on the lake. Scoop up rare collectibles at country stores and local shops. Indulge in 15 varieties of bacon at The Saltbox Smokehouse. Find your flavor in Wayne County.